Beer. Beer. Beer. We love beer. We might have had a few already. Yeah, it’s early. But it’s also National Beer Day. So we’ll forgive our own indulgences. You may not have known about this holiest of holidays before you booked your trip, but you do now. So live it up in Vegas while you’re here. These are the best ways to celebrate National Beer day in Las Vegas. They should probably put that sign on the freeways as you come into Las Vegas. Photo courtesy of Great Vegas Festival of Beer. 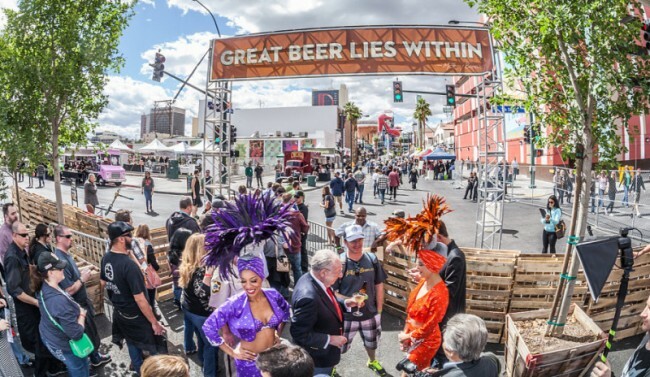 They’re waiting for the weekend to drink because they’re better people and not “problem drinkers” like us, but the Great Vegas Festival of Beer on April 11 will be worth the wait. Called the Woodstock of Las Vegas beer festivals, by us, just now, for the first time, Great Vegas Festival of Beer is an epic adventure in day drinking. This year, the event will be held in the downtown area of Las Vegas, on and around the eastern area of Fremont Street. If you’re a tourist and that description means nothing to you, it’s downtown, east of the big martini glass, glowing girl in a bikini and big red shoe. If you still can’t find it just follow a drunk person. You’ll either end up at the beer festival or have a really weird story to tell when you get home. House of Blues Silent Disco – Where you can rock out to music only you can hear by wearing provided headphones then dance like everybody is watching and hopefully listening to the same music. Zappos Human Arcade – This is exactly the kind of thing you’d expect from a company that just got rid of the concept of managers. Play a bunch of games like Plinko, Pong and giant checkers, all while beering it up. Live Music – When you want to just stand there and listen to something in between sips, or chugs, Josh Royse and Brumby will be hitting the stage throughout the day to entertain and mask the sounds of screaming livers. Brewlogic – Educational sessions all about beer, beer-making and the process of turning your coping mechanism into a craft. Experts will be on hand to teach. But the important thing to remember here is there’s a doughnut and beer pairing. So go to that. Just don’t get in line ahead of us. We might trample you without mercy trying to get at those doughnuts and beer. After Parties — The Bunkhouse Saloon, one of the best watering holes and music venues in town, will host an after party from 7 – 10 p.m. They’ll have beer tastings of a new Wasatch Brewery Polygamy NITRO Porter. Yep, that says polygamy. Because who can settle for just one beer? And the official after party for the festival will be at Atomic Liquors from 7 – 10 p.m. For anyone still able to stand after the festival, hit up one of these parties and take care of that pesky equilibrium. A few breweries you should especially check out while you’re there are CraftHaus, Green Flash and Pizza Port. Of course we could go on and on, but we’ve got more beer to talk about and we’re starting to get hungry. So we’ll just note that the festival will also have a ton of food, a cigar lounge, cider and wine stands and more breweries than we can shake a stick at. And if you doubt our stick shaking ability, just you wait until we’ve knocked back another brew, then we’ll show you what for. Can you imagine a better place to drink beer and drunkenly spill all your secrets to strangers? We couldn't before we did that exact thing. We regret nothing. Photo courtesy of Park on Fremont. If you’re not actually going to be here for the beer festival, or if you need to build up to the festival a few days in advance, like training for a marathon by jogging, Vegas has another beer event for you. And this one is recurring every month. 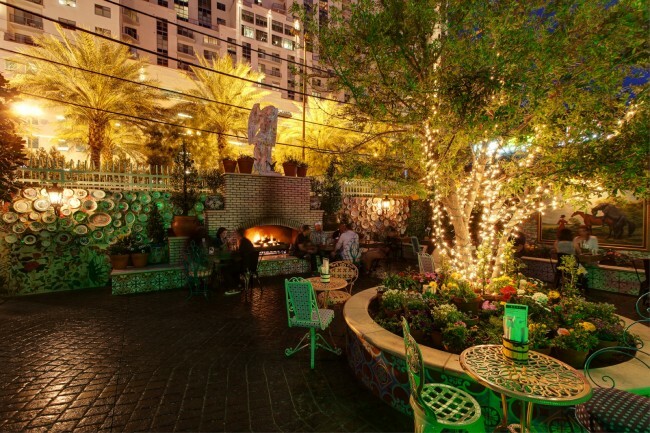 Starting April 9, the brilliant bars of Due and Proper at The District at Green Valley Ranch in Henderson and Park on Fremont on Fremont East in downtown Las Vegas will host their Aleluminati beer tasting event. Don’t worry if you don’t get the name right away. It took us a while too. Of course we’re about four beers deep at this point. So beer with us. Get it? Lol. Each month the good people at Corner Bar Management Group, along with the equally good people at Southern Wine & Spirits, will tap a different keg and let all the guests sample the specialty beer while learning about the craft nature and what makes it unique. We probably don’t need to point out that we have no idea whether or not these people are actually good or not. We don’t know their lives. They could be those awful people who don’t signal when they change lanes. But damn it they know their beer. And don’t worry, we’re not driving anywhere tonight. We’ll get a ride to Due and Proper. Hey can we have a ride to Due and Proper? The event is open to the public, but guests are encouraged to RSVP at aleluminati.com. If you look closely you'll notice that there's also beer in this picture. Photo courtesy of Hofbräuhaus. This is Vegas. You already know that. What you might not know is that beer is pretty much everywhere here. You can get a drink at about a billion bars in casinos—we’re rounding up on that number—and even restaurants have beer menus. If you don’t want to wait for a special beer event, and if you think National Beer Day should be every day of the time, try some of our best spots for beer. Big Dog’s Brewing Company is just off the Strip on Rancho Drive and offers a variety of dog-named brews that contain little to no dog. (They contain no dog at all. We’re just making a joke. The beer is way more delicious than dog.) Ellis Island is on the other side of the Strip and creates some fantastic microbrews in a welcoming casino environment. Triple 7 at Main Street Station is one spot for local beer downtown. And Hofbräuhaus has some of the best Bavarian style beer you’ll find outside of Bavaria. You know what we could go for right now, a Bavarian cream doughnut. What would that pair with? We’ll go with the Dunkel. Wait, what were we talking about? If you’re looking for a wider selection of big names and exotic beers, The Pub at Monte Carlo, Public House at Venetian and Todd English P.U.B. at The Shops at Crystals all have intriguing selections to choose from and more choices than you can sample in one trip. That is not a challenge. You do not want to end up feeling like we’re pretty sure we’re going to be feeling tomorrow morning after trying to write this while downing so many styles and free samples and we think we might need to go lie down in a second.